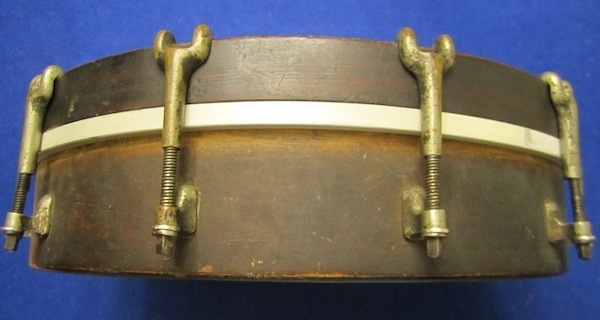 The early 1900s saw a great deal of experimentation in drum design and construction. 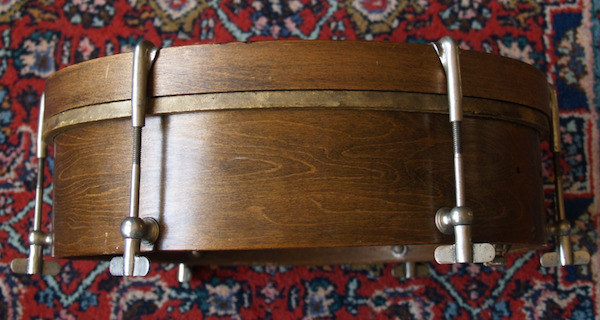 One model which caught on for a brief time but has long since gone nearly extinct is that of the single head snare drum. 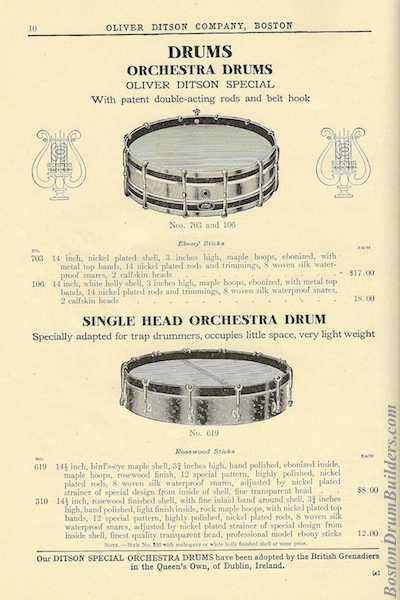 Single head snare drums served several purposes. For one, they were compact in size and were highly portable. A small drum with only one head could easily nest with other smaller drums or be filled with traps and sound effects to be packed and transported to the next gig. 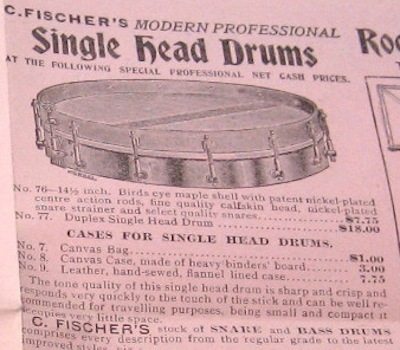 Also, single head drums were by their very nature economical since they didn't require as much material to assemble. In some instances, these drums were constructed with less than high end shells and hoops which further reduced production costs. 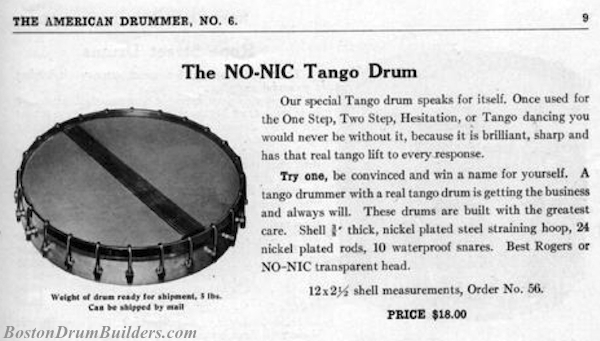 It should be noted that companies were not promoting single head drums as being top of the line. Instead, these drums were targeted towards working drummers who were on the move and those buyers who were looking for cheaper options than the high end models. 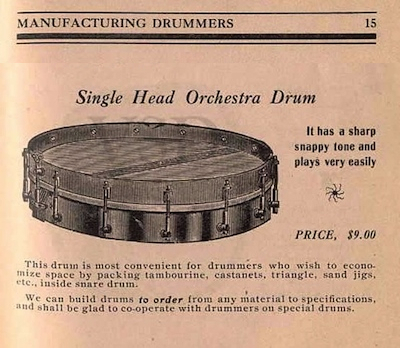 This isn't to say, however, that single head drums were poorly built. In terms of construction, most of these drums are fairly straight ahead. The three examples pictured here, as well as all of those depicted in catalog artwork below, utilize a single wooden counterhoop. Some use conventional tension rods and some use thumbscrew rods. Many but not all had some sort of posts affixed to the shell to facilitate the positioning of the tension rods. The style of hooks used to pull tension down on the hoop vary by maker. Some designs tension from the top but most tune from the bottom where the tensioning hardware would remain completely out of the way of the player. Perhaps the most unique aspect of these drums is how the snares are mounted inside of the drum against the bottom of the head. 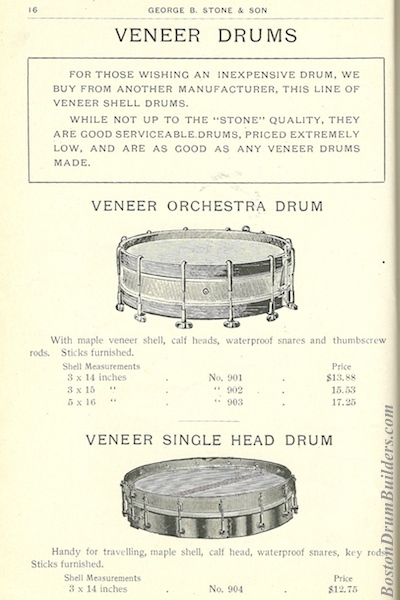 Some models had only a simple strainer with which to adjust the snare tension. Other examples, such as the one pictured at top, had a true throw-off capable of engaging or fully disengaging the snares from the head. The three drums pictured at right are all of unknown make. No badge or label is present on any of the three nor do they match up definitively with any of the catalog pages below. 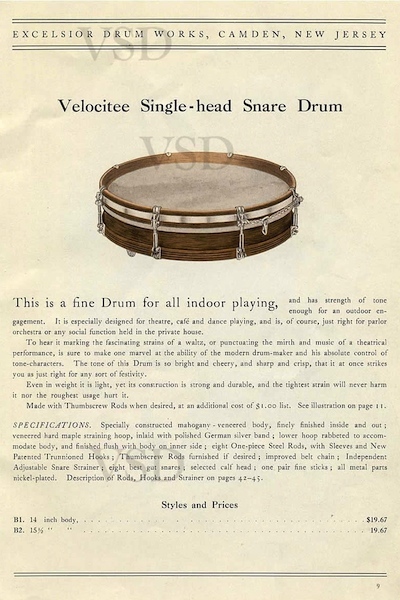 This speaks to a couple of point including the inherent generic nature of these drums, and the fact that these were generally considered lower level instruments even in their day. It would appear that many companies were less likely to herald or even label these instruments as they left the factory. In the catalog pages below, most of which date from the 1910s, you will notice some shared artwork. Where these instruments were being manufactured is unknown. 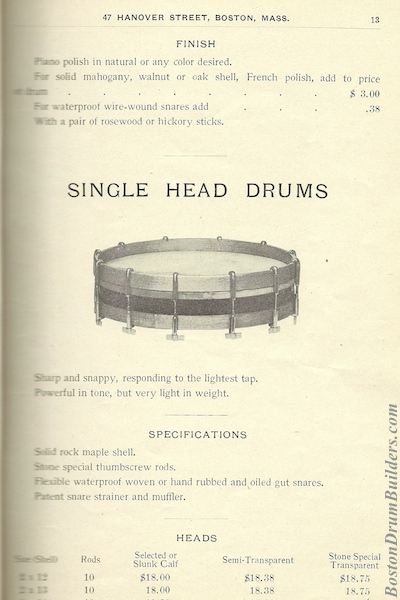 Note how adamantly the second Stone & Son catalog states that their single head drums are bought from another manufacturer! 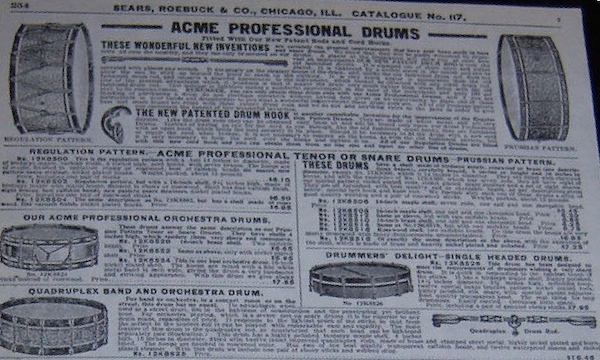 Again, this all speaks to the fact that these instruments were popular economical offerings available through a great number of companies during the early 1900s. 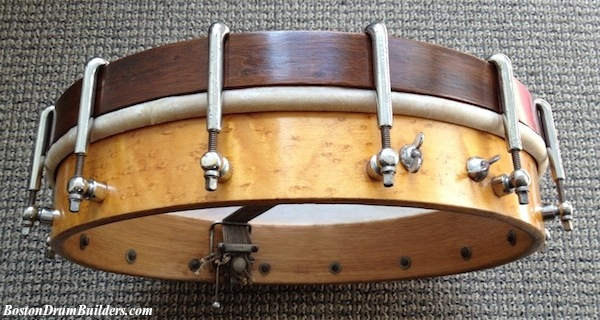 Do you have a single head snare drum? I want to to hear from you! Send Lee an email at lee@vinson.net.